"The Brahma-samhita is a very important scripture. Sri Chaitanya Mahaprabhu acquired the Fifth Chapter from the Adi-keshava temple. In that Fifth Chapter, the philosophical conclusion of achintya-bhedabheda-tattva (simultaneous oneness and difference) is presented. The chapter also presents methods of devotional service, the eighteen-syllable Vedic hymn, discourses on the soul, the Supersoul and fruitive activity, an explanation of Kama-gayatri, kama-bija and the original Maha-Vishnu, and a detailed description of the spiritual world, specifically Goloka Vrindavana. The Brahma-samhita also explains the demigod Ganesha, Garbhodakashayi Vishnu, the origin of the Gayatri mantra, the form of Govinda and His transcendental position and abode, the living entities, the highest goal, the goddess Durga, the meaning of austerity, the five gross elements, love of Godhead, impersonal Brahman, the initiation of Lord Brahma, and the vision of transcendental love enabling one to see the Lord. The steps of devotional service are also explained. The mind, yoga-nidra, the goddess of fortune, devotional service in spontaneous ecstasy, incarnations beginning with Lord Ramachandra, Deities, the conditioned soul and its duties, the truth about Lord Vishnu, prayers, Vedic hymns, Lord Siva, the Vedic literature, personalism and impersonalism, good behavior, and many other subjects are also discussed. There is also a description of the sun and the universal form of the Lord. All these subjects are conclusively explained in a nutshell in the Brahma-samhita." An ancient text offers us a vision of the spiritual world—a vibrant, transcendentally variegated world of devotion to Krishna. The origins of the text known as Sri Brahma-samhita are lost in cosmic antiquity. According to Vedic tradition, these “Hymns of Brahma” were recited or sung countless millennia ago by the first created being in the universe, just prior to the act of creation. The text surfaced and entered calculable history early in the sixteenth century, when it was discovered by a pilgrim exploring the manuscript library of an ancient temple in what is now Kerala State in south India. Prior to the introduction of the printing press, texts like Brahma-samhita existed only in manuscript form, painstakingly handwritten by scribes and kept under brahminical custodianship in temples, where often they were worshiped as shastra—Deity, or God incarnate in holy scripture. The pilgrim who rescued Sri Brahma-samhita from obscurity was no ordinary pilgrim, and His pilgrimage was meant not for self-purification, as is the custom, but for world-purification. He was Sri Chaitanya Mahaprabhu—saint, mystic, religious reformer, and full incarnation of the Supreme Lord. Sri Krishna, descending into the present epoch for the salvation of all souls. At the time of His discovery of the text, Sri Chaitanya was touring south India, preaching His message of love of Krishna and promulgating the practice of sankirtana congregational singing of the holy names of God. Sri Chaitanya commenced this tour shortly after becoming a monk (sannyasi), at age twenty-four, and the tour lasted approximately two years. After a southward journey from Puri (in Orissa State) to holy places such as Sri Ranga-kshetra, Setubandha, Rameshvaram, and finally Kanyakumari (Cape Comorin), He turned northward and, traveling along the bank of the Payashvini River in Travanchore State, reached the temple of Adi-keshava in Trivandrum District. Sri Chaitanya’s principal biographer, Srila Krishnadasa Kaviraja Gosvami, writes in Chaitanya-charitamrita (Madhya-lila, Ch. 9) that upon beholding the holy image of Adi-keshava (Krishna) in the temple, Sri Chaitanya swooned in spiritual ecstasy, offered fervent prayers, and chanted and danced in rapture, a wondrous sight that was beheld with astonished appreciation by the devotees present. After discussing esoteric spiritual matters among some highly advanced devotees, Sri Chaitanya found “one chapter of the Brahma-samhita.” (What we now have as Brahma-samhita is, according to tradition, only one of a hundred chapters composing an epic work lost to humanity.) Upon discovering the manuscript. Sri Chaitanya felt great ecstasy and fell into an intense mystic rapture that overflowed onto the physical realm, producing a profusion of tears, trembling, and perspiration. (We would search the literature of the world in vain to find a case in which the discovery of a lost book inspired such unearthly exhilaration!) Intuiting the Sri Brahma samhita to be “a most valuable jewel,” Sri Chaitanya employed a scribe in hand copying the manuscript and departed with the copy for His return journey north. Upon His return to Puri (Madhya-lila, Ch. 11), Sri Chaitanya presented Brahma-samhita to appreciative followers like, Ramananda Raya and Vasudeva Datta, for whom Chaitanya arranged copies to be made. As word of the discovery of the text spread within the Vaishnava community, “each and every Vaishnava” copied it. Gradually, Brahma-samhita was “broadcast everywhere” and became one of the ‘major texts of the Gaudiya-Vaishnava canon. “There is no scripture equal to the Brahma-samhita as far as the final spiritual conclusion is concerned,” exults Krishnadasa Kaviraja. “Indeed, that scripture is the supreme revelation of the glories of Lord Govinda, for it reveals the topmost knowledge about Him. Since all conclusions are briefly presented in Brahma-samhita, it is essential among all the Vaishnava literatures” (Madhya-lila 9.239-–240). 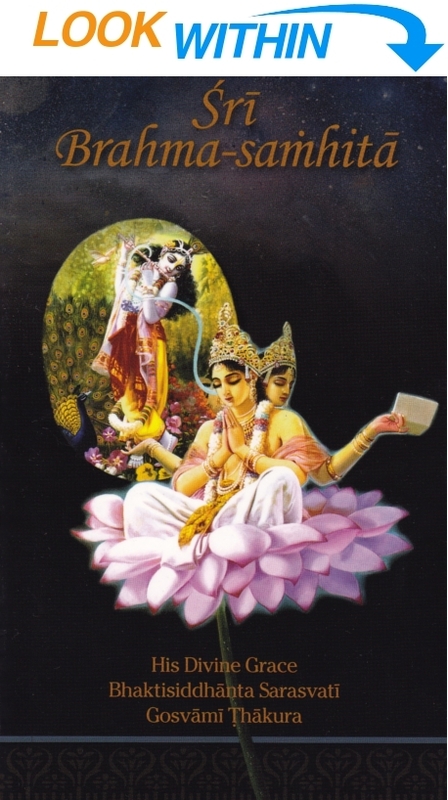 In spite of the seemingly topical complexity of the text, the essential core of the Brahma-samhita consists of a brief description of the enlightenment of Lord Brahma by Lord Sri Krishna followed by Brahma’s extraordinarily beautiful prayers elucidating the content of his revelation: an unearthly, beatific vision of the Supreme Personality of Godhead, Lord Sri Krishna, and His eternal, transcendental abode, Goloka Vrindavana, beyond the material cosmos. This core of the text stretches from verse twenty-nine through fifty-six, and a brief, subsequent exposition by Lord Krishna on the path of Krishna bhakti, love of God, brings the text to a close. Lord Brahma thus meditates upon Lord Krishna in His spiritual realm and hears the divine sound of Krishna’s flute. The kama-gayatri mantra (klim kamadevaya vidmahe pushpa-banaya dhimahi tan no ’nangah pracodayat), the “mother of the Vedas, ” is made manifest from the sound of Krishna’s flute, and Brahma, thus initiated by the supreme primal preceptor Himself, begins to chant the Gayatri. As Srila Prabhupada puts it, “When the sound vibration of Krishna’s flute is expressed through the mouth of Brahma, it becomes gayatri” (Teachings (of Lord Chaitanya, p. 322). Enlightened by his meditation upon the holy Gayatri, Brahma “became acquainted with the expanse of the ocean of truth.” Inspired by his profound and sublime realizations, his heart overflowing with devotion and transcendental insight, Lord Brahma spontaneously begins to offer a series of poem—prayers to the source of his enlightenment and the object of his devotion, Lord Sri Krishna. These exquisite verses form the heart of Brahma-samhita. I worship Govinda [Krishna], the primeval Lord, the first progenitor who is tending the cows, yielding all desire, in abodes built with spiritual gems, surrounded by millions of purpose trees, always served with great reverence and affection by hundreds of thousands of lakshmis or gopis. I worship [Goloka Vrindavana]… where every tree is a transcendental purpose tree; where the soil is the purpose gem, all water is nectar, every word is a song, every gait is a dance, the flute is the favorite attendant, … where numberless milk cows always emit transcendental oceans of milk. The commentator [Srila Bhaktisiddhanta Sarasvati] reminds us that in the transcendental region of Goloka are found the same elements as are found in the mundane worlds, but in their highest purity and beauty: “trees and creepers, mountains, rivers and forests, water, movement, speech, music of the flute, the sun and the moon, tasted and taste…” Krishna’s divine abode, Goloka Vrindavana, is a world in the fullest and realest sense. Bhakti as a state of consciousness, then, is attained through bhakti as a practice, a discipline. For this reason, Lord Krishna, in His response to Brahma at the end of the text, summarizes the path of bhakti in five aphorisms. This devotional discipline goes beyond conventional piety. It necessitates “constant endeavor for self-realization” (Bs. 59), involving both a turning from worldliness and sense gratification and an adherence to spiritual practices and behavior, under the guidance of authorized scripture. Through such practice, then, the materialist is soon purified of his tendency toward philosophical negation and comes to understand the nature of positive transcendence. Others will find Lord Brahma’s vision of the spiritual realm problematic for a related, but perhaps more subjective, emotional reason that goes to the heart of the human condition. There is a kind of ontological anxiety, a conscious or subconscious apprehension about beingness or existence itself, that goes along with embodied life in-the-world—that accompanies the soul’s descent into the temporal, endlessly changing world of matter. Material bodies and minds are subjected to a huge variety of objective and subjective discomfitures, unpleasantries, and abject sufferings. Viewed philosophically, embodied personhood, false-self (ahankara), is, to a greater or lesser degree, innately a condition of suffering. Because personal existence has been experienced by materialists as essentially painful, writes Srila Prabhupada in his Bhagavad-gita commentary, “the conception of retaining the personality after liberation from matter frightens them. When they are informed that spiritual life is also individual and personal, they become afraid of becoming persons again, and so they naturally prefer a kind of merging into the impersonal void” (Bg. 4.10, purport). Entering the path of bhakti, however, such persons can gradually begin to experience their real, spiritual selves and a release from egoistic anxiety. In that purified state, they become able to relish Brahma’s vision of blissful, personal spiritual existence in Goloka. Still others, however, might criticize Brahma-samhita on the grounds that the text, being quite specific and concrete in its depiction, merely offers another limited, sectarian view of God and His abode—a view in conflict with other, similarly limited views. Such persons prefer a kind of genericized Deity who doesn’t offend variant theological views with definable, personal attributes. Brahma-samhita, however, is not a polemic against “competing” conceptions of the Deity (except those, of course, which would deny His transcendental personhood). Vaishnava tradition does not dismiss images of the Divine derived from authoritative scripture from beyond its own cultural and conceptual borders. It respects any sincere effort at serving the Supreme Person, although it holds its own texts as most comprehensive and authoritative. It promotes neither an arrogant sectarianism that would constrain transcendence to exclusive cultural, ideational, or linguistic forms (while burning a few heretics), nor a syncretistic ecumenism that would try to pacify all claimants on the truth by departicularizing it into bland vagary. Let the syncretists and the sectarians come together to appreciate, at least, the aesthetic magnificence of Lord Brahma’s theistic epiphany. What we are experiencing through Lord Brahma in his samhita is not mystic hallucination or quaint mythologizing or an exercise in pious wishful thinking. We are getting a glimpse, however dimmed by our own insensitivities, into the spiritual world as seen by one whose eyes are “tinged with the salve of love.” We are seeing, through Brahma, an eternal, transcendental world, of which the present world is a mere reflection. Goloka is infinitely more real than the shadowy world we perceive daily through our narrow senses. Brahma’s vision of the spiritual realm is not his alone. It is shared by all those who give themselves fully unto the loving service of Lord Krishna—though Brahma admits that Goloka is known “only to a very few self-realized souls in this world” (Bs. 56). We are asked not to accept Brahma’s account of transcendence uncritically and dogmatically but to avail ourselves of the spiritual discipline, bhakti-yoga, that will gradually lead us to our own experiential understanding of this highest truth. In his commentary to the twenty-eighth verse of the Brahma-samhita Srila Bhaktisiddhanta Sarasvati writes that Lord Chaitanya “taught this hymn to His favorite disciples inasmuch as it fully contains all the transcendental truths regarding Vaishnava philosophy,” and he asks his readers to “study and try to enter into the spirit of this hymn with great care and attention, as a regular daily function.” Srila Bhaktisiddhanta’s disciple Srila Prabhupada was very fond of Brahma’s prayers to Lord Krishna, and there are several recordings of Srila Prabhupada singing these prayers with intense devotion. We therefore invite readers to dive deeply into the sweet, transcendental ocean of Brahma’s hymns as a daily meditation. The origins of the text Brahma-samhita are lost in cosmic antiquity. According to Vedic tradition, these “Hymns of Brahma” were recited or sung countless millennia ago by the first created being in the universe, just prior to the act of creation. The text surfaced and entered calculable history early in the sixteenth century, where it was discovered in the manuscript library of an ancient temple in what is now Kerala state in South India. The essential core of the Brahma samhita consists of a brief description of the enlightenment of Lord Brahma by Lord Sri Krishna, the Supreme Personality of Godhead, followed by Brahma's extraordinarily beautiful prayers elucidating the content of his revelation. There is nothing vague about Brahma’s description of the lord and His abode. No dim, nihilistic nothingness, no blinding bright lights, no wispy, dreamy visions of harps and clouds; rather, a vibrant, luminescent world in transcendental color, form, and sound—a sublimely variegated spiritual landscape populated by innumerable blissful, eternal liberated souls reveling in spiritual cognition, sensation, and emotion, all in relationship with the all-blissful, all-attractive Personality of Godhead. The Brahma-samhita is a very important scripture. Sri Chaitanya Mahaprabhu acquired the Fifth Chapter from the Adi-keshava temple. In that Fifth Chapter, the philosophical conclusion of achintya-bhedabheda-tattva (simultaneous oneness and difference) is presented. The mind, yoga-nidra, the goddess of fortune, devotional service in spontaneous ecstasy, incarnations beginning with Lord Ramachandra, Deities, the conditioned soul and its duties, the truth about Lord Vishnu, prayers, Vedic hymns, Lord Siva, the Vedic literature, personalism and impersonalism, good behavior, and many other subjects are also discussed. There is also a description of the sun and the universal form of the Lord. All these subjects are conclusively explained in a nutshell in the Brahma-samhita. The origins of the text Brahma-samhita are lost in cosmic antiquity. According to Vedic tradition, these “Hymns of Brahma&38221; were recited or sung countless millennia ago by the first created being in the universe, just prior to the act of creation. The text surfaced and entered calculable history early in the sixteenth century, where it was discovered in the manuscript library of an ancient temple in what is now Kerala state in South India. The essential core of the Brahma samhita consists of a brief description of the enlightenment of Lord Brahma by Lord Sri Krishna, the Supreme Personality of Godhead, followed by Brahma’s extraordinarily beautiful prayers elucidating the content of his revelation.